The region’s peak environmental advocacy group, the Sunshine Coast Environment Council (SCEC) will co-host a public information session with local community group Development Watch on Saturday 11 April from 2pm at the Coolum Civic Centre on the Sekisui House proposal at Yaroomba. 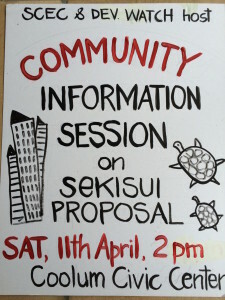 “With the release of ‘revised concept plans’ by Sekisui House on which Council will soon consider a major planning scheme amendment, the community deserve an opportunity to learn more about what’s involved and what’s at stake to accommodate their multi high-rise, mixed use residential development proposal,’ said SCEC spokesperson, Narelle McCarthy. 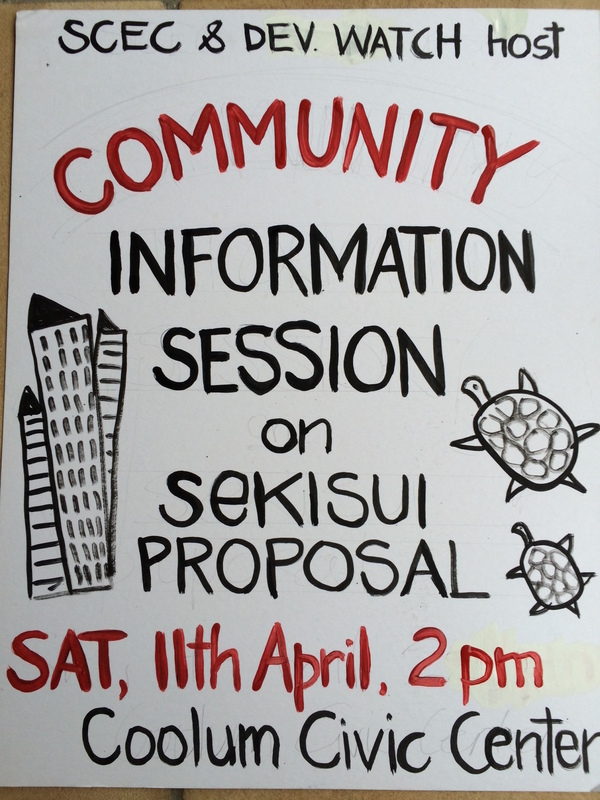 “Despite a genuine invitation and repeated requests to present and discuss their revised concept at the information session, we’re extremely disappointed that Sekisui House has chosen not to engage with the community” she said. The revised Seksiui concept still conflicts significantly with the current planning scheme adopted in May last year following extensive community and stakeholder consultation. The information session will cover planning history and context of the site, what is allowed under the current town plan, the planning process, results of community exit polls and surveys, environmental matters and an interactive Q&A. “We urge everyone who has an interest or concern in this proposal to attend, learn more and participate in this timely information session. This proposal is a critical litmus test for the new planning scheme and the Sunshine Coast as a whole” Ms McCarthy said. The Sunshine Coast Council is expected to consider a major amendment to the planning scheme at a Special Meeting on 27 April in Caloundra. The Sunshine Coast Environment Council (SCEC) is the peak regional environmental advocacy group on the Sunshine Coast, Queensland. Established in 1980, it currently represents 50 community groups working on conservation and sustainability with a combined membership of over 15,000 individuals.